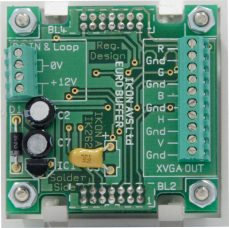 50mm module with a compact dual output buffer. 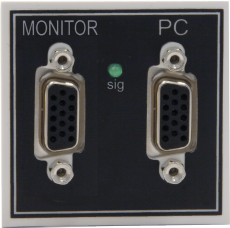 The front HD15 sockets are for the XVGA input and loop to a monitor whilst the rear connections are via screw terminals for RGBH&V. The unit has a signal presence led and requires an external 12V power supply at 60mA. It is capable of driving signals 60m and has a 260MHz bandwidth.